Halal Foods You Have To Try In Istanbul – Eat Like A Local! Besides learning about the history, trying the local foods are one of the best ways to soak yourself in the culture of the place you’re currently visiting. Have you ever wondered: what are some of the foods that are enjoyed by the locals in Turkey on a daily basis? Well, if you are having a Halal holiday in Istanbul, here are some of the Halal foods you have to try in Istanbul! 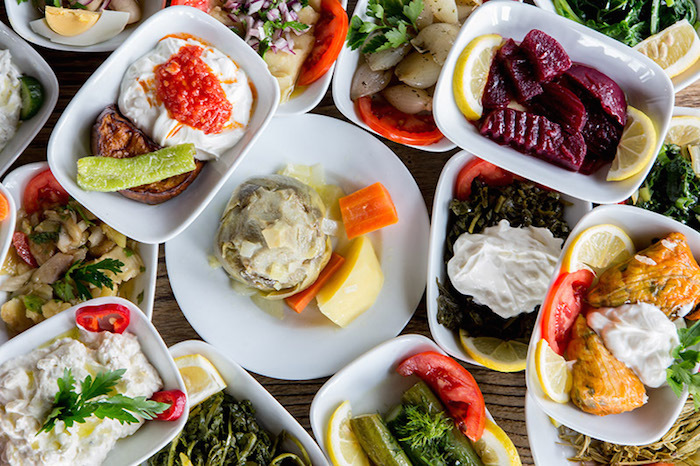 Get a taste of the local, Halal foods you have to try in Istanbul! The Turks love to eat their breakfast like a king! Their rich breakfast typically includes a full set of omelet or boiled eggs (yumurta), Turkish spicy sausage known as sucuk, thick cream known as kaymak, olives, cheese, butter, cucumbers, tomatoes, and soup. Wow, sounds very stomach-filling, yes? When you are in Istanbul, make sure you try this rich Turkish breakfast! 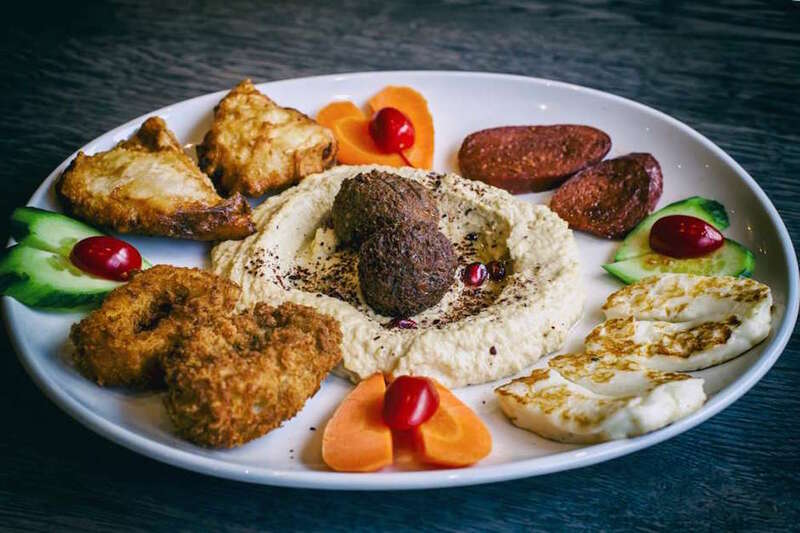 Here are another Halal foods you have to try in Istanbul – Mezes! It is a Turkish appetizer that comes in various textures and flavors. Some of the delicious Mezes that you should try while in Turkey are Patlıcan Ezmesi (grilled eggplants with yogurt), Şakşuka (fried eggplant with tomato sauce), and Barbunya (pinto beans). Döner is another traditional Turkish food that you have to try while in Istanbul. If you are an avid traveller, you might notice that Döner is now available in most countries. 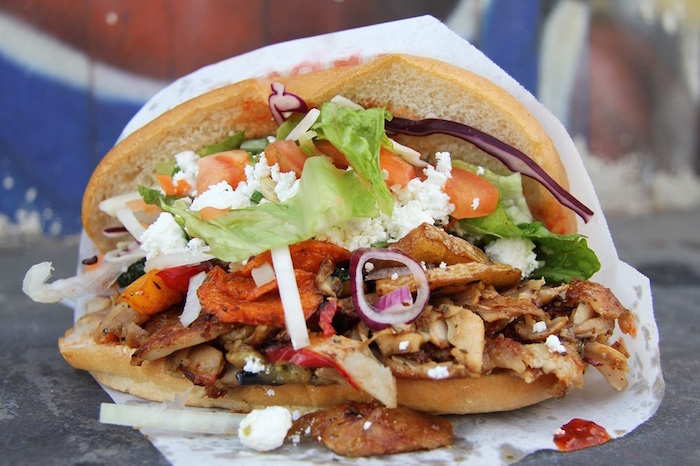 But, we suggest you try the original Döner! In Turkey, Döner comes in many types. There are dürüm (Döner that is wrapped in lavas bread) and iskender kebap, which is Döner on a pide bread with butter, tomato sauce, and yogurt sauce. 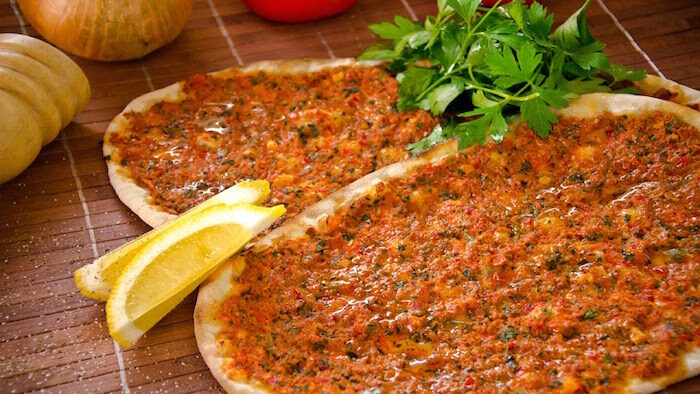 You might have heard of Lahmacun before. Many people call it Turkish pizza. But, it is quite different than the classic Italian pizza. It is a thin and crispy round bread that has minced meat (beef or chicken), parsley, and a squeeze of lemon as its toppings. Simply delicious – you have to try it! Pide is also one of the Halal foods you have to try in Istanbul! 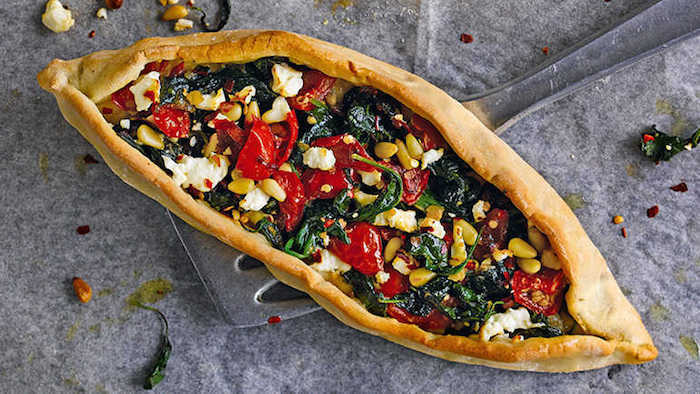 It is a scrumptious boat-shaped dough of bread that has seasoned minced meat, eggs, spinach, sucuk, and kuşbaşı (minced veal meat) as its fillings. After enjoying Turkish appetizer and main course meals at a restaurant in Istanbul, don’t forget to order Baklava. This lovely local dessert is so sweet and crispy, a single piece might not be enough for you. 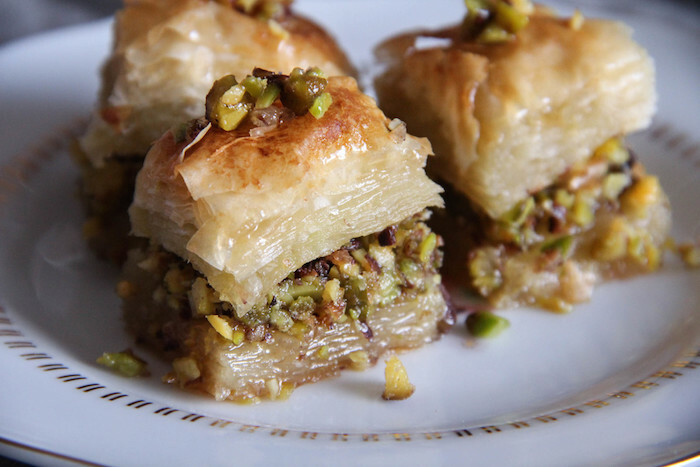 This local food has phyllo dough, nuts, and sweet syrups as its main ingredients. 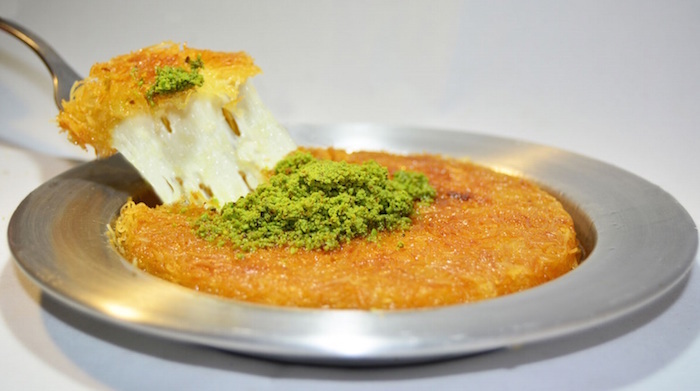 Künefe is also one of the Halal foods you have to try in Istanbul. This pastry dessert is usually served while it is still hot. The main ingredients of Künefe are thin doughs and unsalted cheese. It is then baked in sweet syrup. Finally, grounded pistachio nuts are spread on top. Absolutely tasty! Last but not least, you should also try Kebab while you are having a Halal holiday in Istanbul. There are many types of Kebabs. 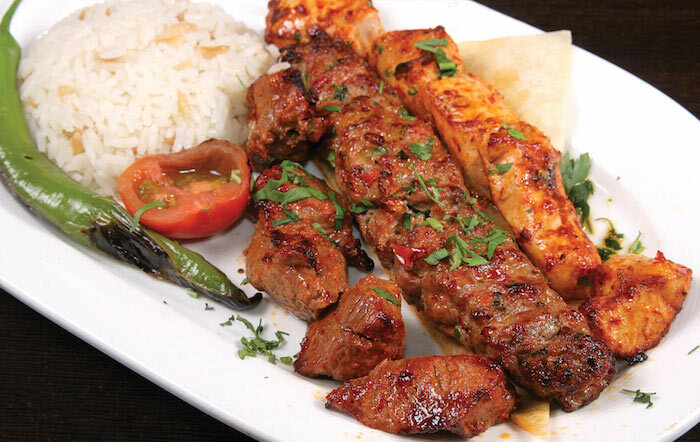 Some of the must-try kebabs are Adana (a mix of lamb meat and tail fat), Beyti (grilled minced lamb or beef wrapped in lava bread with tomato sauce and yogurt ), Urfa (grilled lamb meat on skewers), and Sis (grilled cubes of lamb or chicken on skewers). If you are staying in Turkey for several days, then you should try each one! Halal foods you have to try in Istanbul – they are delicious! You can find all of the traditional cuisines above in many Halal restaurants in Istanbul. They are rich in flavors, have great textures, and look very appetizing too! So, the next time you are in Turkey, make sure you eat like a local and order the meals above. You won’t regret it.